Having some simple Chinese language POS material on your entrance and front window display can go a long way to encouraging Chinese tourists to enter your retail outlet or venue. Business in China has a range of simple Chinese welcome signs including Chinese door vinyls and Chinese window graphics which can be customised with your logo and messaging. 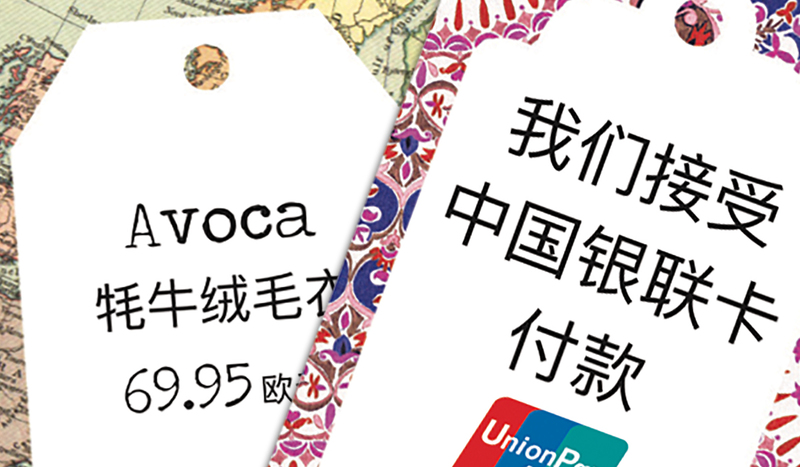 We also provide a range of Chinese POS displays for retailers, including Chinese counter cards, Chinese POS boxes, Chinese posters, Chinese hanging signs, Chinese shelf wobblers, customised with your logo and with your special offers or discounts for Chinese tourists. Our experienced team of Irish and Chinese staff can advise you on what offers or discounts will work best for your type of retail business. And for special Chinese celebrations & festivals (see main events listed below), we can help you design and develop a specific promotional campaign incorporating in-store POS materials as well as online and social media marketing targeting Chinese tourists visiting Ireland as well as Chinese community living in Ireland. Chinese New Year (late January-mid February), Labour Day Holiday Period (early May), Chinese National Day (September), Chinese Moon Festival (October) or Chinese Singles Day (11/11 – 11th November).